We designed their web presence package around their business goals and combined it with a content marketing strategy created by us. At Small Screen Producer, we build sites that are interactive and socially shareable. 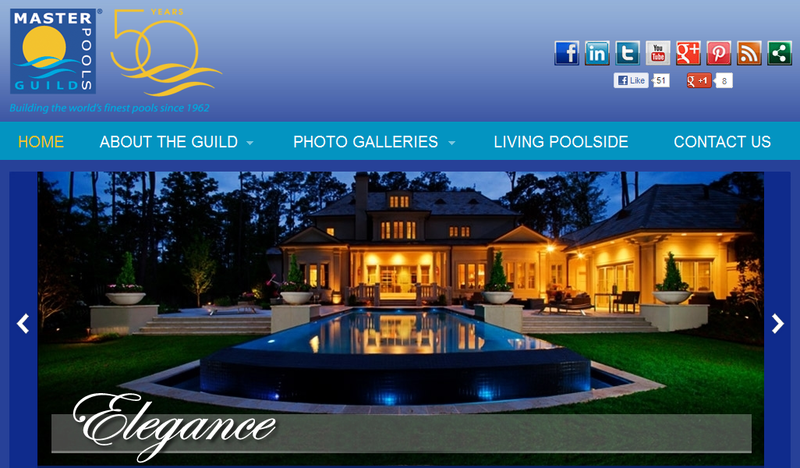 The Master Pools Guild design is unique and customized to their business plan, a signature routine for Small Screen Producer. We also created social media channels to enhance brand awareness for Master Pools Guild and quite frankly, they are awesome lead generating tools and just plain cool! Social media sites like Google+, LinkedIn and Twitter are great ways to nurture an online relationship with customers. Improve your lead generation, like Master Pools Guild, by letting us create search engine optimized, focused and unique social media marketing strategies. These free downloads are all focused to engage customers and generate leads just like the blog, Living Poolside, we built for them. The blog is something every business should be proud of because blogging is a fantastic way to establish an online community with customers that are passionate about your brand. Posting regularly to a blog will give followers more to talk about and more to share and that’s what we created for Master Pools Guild! Overall, we are very excited to share Master Pools Guild and the process we went through when building them a stronger web presence. Their internet footprint has made its mark on the pool building internet and social media scene. To get started on enhancing your own web marketing presence, click below to receive your free online marketing report!